Designed to achieve the dramatic market impact reserved only for the most historic and significant Holden models. A winner from day one, the VN represented a major generational change and was considerably larger and more powerful than its predecessors. Based on an Opel design, but widened and comprehensively restyled for Australia, it had an all-new, rounded body and aerodynamically efficient flush fitting glass. Standard powerplant was a torquey 3.8 litre V6 – as powerful as the old carburetted V8. A fuel-injected 5.0 litre V8, the most powerful mass-produced Aussie engine so far, was standard on the SS model, optional across the range. 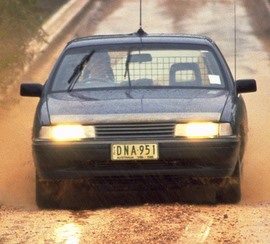 The VN won all three motor magazine Car of the Year awards in 1989 and returned Commodore to the top of the sales charts. After an absence of nearly seven years, the Holden passenger car derived ute made a comeback in 1990 with an all-new VN-based VG Utility and S Utility. Model range: Commodore SL sedan, Commodore Executive sedan and wagon, Commodore Berlina sedan and wagon, Commodore S sedan and wagon, Commodore SS sedan, Calais sedan. Base price when new: $20,014. Total built: 215,180 (includes 5 millionth Holden).